Altogether, The Master is a body of film making in a league of its own. 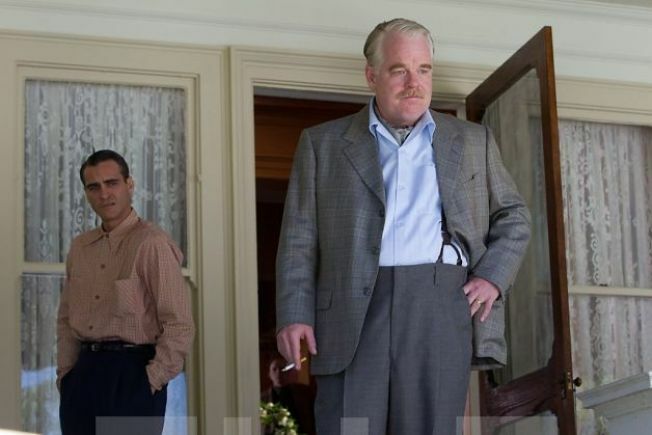 Phillip Seymour Anderson in The Master. "The Master" attempts to untangle Scientology’s enigma, and Director Paul Thomas Anderson has set this centerpiece in motion with same intense and alluring direction as his last film, "There Will Be Blood." Undoubtedly, this film, by itself, can even be viewed as the unraveling of Anderson’s captivating role both as the film’s writer and director. The film was mainly shot in various Bay Area locations, including San Francisco, Sacramento, Berkeley, Crockett, and Vallejo’s Mare Island, I could only then but languish on this idea, especially, with the film’s anticipated pervasiveness of Scientology. The question, “Is The Master truly about Scientology?” is intriguing. Anderson depicts the answer with very intense historical, emotional, and psychological stages. The film’s opening scene alone is beguiling as a non-nonchalant character, Freddie Quell (Joaquin Phoenix), is being introduced without any lucidness. This type of uncanny direction pervades the entire film. However, "The Master," undoubtedly bears resemblance to this religion. It represents an organization called The Cause and its larger-than-life leader, Lancaster Dodd (Phi lip Seymour Hoffman), with obvious parallels to L Ron Hubbard, founder of the Church of Scientology, because of Dodd’s eccentric and radical theories in the film’s 1950’s post-war America. Quell is a seaman who, obviously, has succumbed to uncontrollable spin of alcoholism. Due to this relentlessness, he even concocts drinks with a mixture of biohazard materials. After serving a fatal drink to a migrant worker in a cabbage field, he then dashes and finally stumbles upon a yacht, and decides to stow away on board. It is through Quell that Dodd is introduced in the movie. He is the leader of this burgeoning religion and who is en-route on a voyage with his followers, led by his wife, Peggy (Amy Adams), to celebrate the wedding of their daughter. The storyline, at this point, is still not clear. The conversations mainly speak of self-empowerment that could also be construed as in comprehensive “blah, blah, and blah”. It is portrayed as an idea that Dodd creates as he goes along. It is also then that I cannot seem to have a pulse on how the movie will finally unfold. If there is one consolation to these throes of uneasiness, it is at this state when I can conclude that this movie is excellent in both direction and performances albeit editing could have shortened the film’s running time. Anderson filmed this movie in a 65mm print-format that is projected in select 70mm movie theaters around the world, including this year’s Venice Film Festival. I would highly recommend for everyone to take a jaunt to a nearby theater that is offering this type of novel viewing experience. It has made 'The Master' a visual feast to say the least! Altogether, The Master is a body of film making in a league of its own. Anderson has proven that obscurity can best be explained by its very own obscurity in both screenplay and lens of the camera. Phoenix and Hoffman’s performances are spectacular. It opens Friday, Sept. 21 at Bay Area theaters. Beau Behan's claim to fame is that his last name being the same as that of the Irish novelist, Brendan Behan. He is the former California Independent Film Festival's Program Director, and is the co-founder of the Jazz Festivals in Orinda and Moraga, Calif., east of San Francisco. He is currently writing a romance novel, and he sees himself as a romantic Rudolph Valentino type, but realizes you probably don't.